Castle Ashby is the home of Earl Compton. The house isn't open, but the gardens are, and we have been there a lot over the years. If you are ever within spitting distance of Northamptonshire, go. It's open right the way through the year, not just for the Craft Fair I wrote about yesterday. The gardens are tremendous, and the garden buildings amazing. The Castle Ashby orangery is as big as the average village hall. I am always caught between awe at its beauty and relief that it is not me who has to do the maintenance. This is a Victorian beehive. It must have been quite a sight when it was in full working order, particularly as there are two; the other being opposite. Yesterday (the day that didn't rain) we went to see El Caballo de España at the Castle Ashby Craft Fair. My only regret is that I really haven't sussed photographing movement so have very few photographs which are any good. Such a shame, as the horses really merit much better. On the website front, I've done some new authors. Click here for the full list. 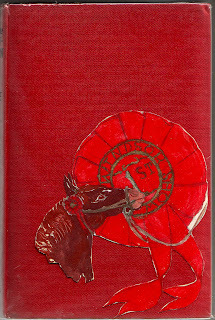 I particularly liked Ann Pilling's donkey book, which has rather more to it than the average picture book. On the sales front, I've loaded more new stock up: principally Collins Seagulls. And a few paperbacks (including the excellent Can I Get There by Candlelight? ), illustrated below. I've just bought this copy of Christine Pullein-Thompson's The First Rosette. Its original owner had created this rather charming addition, as the book doesn't have its dustjacket. The head and rosette motif is removable (it's been placed behind a removable plastic cover) but I thought I'd leave it as it was. I have a new car, and OH and I were musing over the cars we have had. 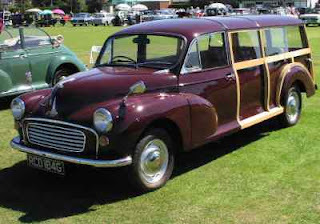 The first car we bought together was a Morris Minor Traveller, which was a pale blue version of the one below (though that one does look as if it has been extended). The Morris was full of character, and brilliant for edging out into 1990s London traffic as people thought "Ah, cute Morris," rather than "Pushy b****** BMW driver". It was, however, a mechanical disaster. It spent weeks at a time in various specialist garages, and we spent hundreds on it. Every time it went in for its MOT, we dreaded being rung up, told it had failed (it always had) and hearing what we came to think of as the W word - welding. I woke the pigs up this morning. Captain Guy Lucas, who judged hunters in the first half of the 20th century, finished judging a class and left the ring. He was accosted by a peeress, cross because her hunter had not been placed. "You," she told Captain Lucas, "should be judging cows, not horses!" "Yes ma'am," said Captain Lucas. "And if I had you in front of me I should give you the first prize!" Thank you to the author and publisher for sending me this copy to review. I am treading new ground here reviewing non fiction. I read a lot of non fiction, particularly social history, but have thus far kept my comments on what I've read for my nearest and dearest, so I'm grateful to Elaine Walker for giving the chance to get my teeth into something new; not that I'm about to savage this book, just chew it over in a pleasurable and ruminative sort of way. A lot of what I review is children's literature, or books which are generally not going to take time to read. Horse is a survey of the horse; how it influences humankind and how humankind influences it. It is not a book that you're going to whizz through. It's a book that repays a gentle pace, particularly if, like me, you are prone to getting excited about what you are reading and having to go off and investigate further. I was going to do a blethery introduction to this clip, but it doesn't need it. Look away now if you cannot get Radio 4. Or do not listen to The Archers. This post will mean nothing to you. I missed yesterday's episode of The Archers (long running radio soap - everyday story of farming life, for non UK people who've read this far.) WHY WHY WHY did David feel he had to tell Lizzie all? Though thankfully he missed out the "Are you a man or a mouse?" bit. Was gripping the keyboard moaning SHUTUPSHUTUPSHUTUP, but did he listen? No. Did he leave Lizzie and her family to carry on picking up the pieces of their lives? No. To salve his own conscience he spilled. The keen pony book reader will know many books where a pony gets from A to B on a train. Rapide arrived at Jill's on a train in Jill Has Two Ponies, and Christabel Raffington's rescued Daybreak travels on a train in Josephine Pullein-Thompson's I Had Two Ponies. Train travelling horses were in fact legion, but I'm not sure if there's still such a thing as a horse car. From this story on BBC Wales, it would appear not. I love my roses with a passion and every year I do a blog post about them. I have a couple (well, three) new ones this year, and will get another one later this week. The roses really mark the end of the point at which our garden is interesting. I always mean to buy more interesting stuff for later in the year, but never do. Here is Blanc Double de Coubert (I think - I can't find the label). Mme Jacques Cartier - it is her first year flowering properly. Fantin Latour, which is having another spectacular year. There are whole fields of equine weirdness Lady Gaga has not yet plumbed, but she's on the way. I should have read the email telling me about this with more care. When I went to to the recommended page and read about the horse head fiddle in the local history collection at Moyses Hall, Suffolk, I thought at first it was called that because of a similarity in shape: wrong. It's called a horse head fiddle because it is made out of a horse's skull. Apparently it sounds as bad as it looks. Scroll down (right to the end) to see it in all its glory. Alas the picture doesn't enlarge. Many thanks to Rosemary Hall for telling me about this. The horse head fiddle part two. This is what I thought I was going to get in the initial horse head fiddle investigation. The morin khuur is a traditional Mongolian instrument with two strings. One string was made with hairs from a stallion's tail, and the other with hairs from a mare's. The bow was strung with horse hair, and the sound box was wood. I found a couple of legends on Wikipedia about the instrument's genesis: both have the instrument being created out of the bones of equine tragedy. In one a beloved winged horse is killed when a jealous woman cuts off the horse's wings so it crashes to the ground and dies. The rider made a fiddle from the remains, and used the fiddle to mourn the horse. Another legend has a wicked lord killing a boy's beloved white horse. The horse's spirit instructs the boy to make an instrument from its bones and hair. I'm not a terribly good advertisement for the eating seasonally school of thought; more particularly eating what we have in the garden etc. I always mean to eat what's around in the garden but there's always something that slips past me. When we moved here, the garden was infested with elder trees. We've drastically cut down their number now. As is ever the way with these things, we thought the multitude of elder trees we had on the fence line in the field would supply all elder needs, but then they all virtually as one decided to suffer. Whether they were the same age and all shuffled off the mortal at the same time, or whether they all got some strange disease, or whether (top theory at the moment) the succession of icy winters we've had has not helped, I do not know. The pigs are now in a new field. 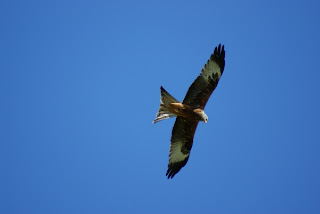 Thundering up and down the M40 yesterday, on my way to buy books I lost count of the number of Red Kites soaring along. Because I'm not that kind of horse. Fellow book dealer Barbara Fisher at March House Books has just started a blog: she has a lovely piece about finding a poem for a customer (you don't get that kind of service at Amazon), illustrated with some Margaret Tarrant drawings. Margaret Tarrant isn't I must admit my first choice of illustrator, but I do wonder quite what fate awaits the child at the beginning of the post. Innocent watery splashes up his lovely clean socks, a Dawn French-esque disappearance or something else entirely? Piccalilli Pie has a gorgeous post on the Bushtit - what we in the UK call by the technical term of LBB (Little Brown Bird). "Ballyderown Top Notch is a 10 year old gelding. He is a grade A registered show jumper who was recently acquired by his current rider.An extremely honest and experienced pony he will take any capable young rider to a very high level.The pony is being sold reluctantly as the rider is an unappreciative spoiled brat." Here's a link to the ad. I hope the pony's now gone to a deserving owner, maybe one who's worked frantically at paper rounds, babysitting, and saving farms from fires in order to be able to afford him. Actually last weekend. Still catching up.